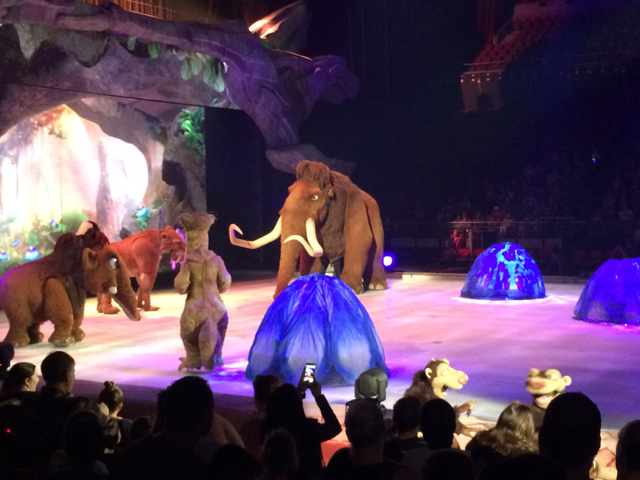 Little Miss and I were invited to Ice Age Live! A Mammoth Adventure last weekend at Qudos Bank Arena (previously known as Allphones Arena). It was such a great show, little Miss loved it! I enjoyed the show even though I had to answer a barrage of questions from her asking me 'why mum? ', 'what's going to happen mum? ', 'is she ok mum?' etc. She was really into it and needed to know what was happening and going to happen! Ice Age Live! A Mammoth Adventure brings the Ice Age movies together with the movies' favourite characters Sid, Manny, Diego and Scrat the saber-toothed squirrel! This is the first show that combines ice skating, aerial arts, puppetry and the movie Ice Age. The show takes the audience on a mammoth adventure with its favourite characters and Manny, Ellie and their mammoth calf Peaches. A few minutes into the show, the herd soon become troubled by some evil birds interested in Sid the sloth and the two cheeky possums Crash and Eddie and set out on an adventure. The show characters switch between acting in their movie suits and doing aerial arts all while ice skating within the movie theme which is quite impressive. Little Miss was a bit scared of the birds at first but laughed at their antics. She loved the herd of foxes, fairy like plants, Sid's fan club buddies and other cool creatures during the show. There are some beautiful and funny moments. I enjoyed when Peaches did a solo song and when her mother sang to her. Children enjoyed seeing the characters interact with the audience in the front rows. We were sitting eight rows from the front on the left side of the stage and had a great view of the show. It was a magical show, it was almost two hours with a 20 minute intermission which was much needed as some children were getting restless after the first hour. Probably in need of ice cream and popcorn like little Miss kept reminded me! Little Miss is almost 4 and Little Mister 4 months also came with us. He was quite captivated by the show and the mammoths were big enough for him to spot and stare at! The music was very nice and not loud which was good and the dimmed lighting didn't bother younger kids near us and was ideal for a breastfeed and a little nap when Little Mister needed it. 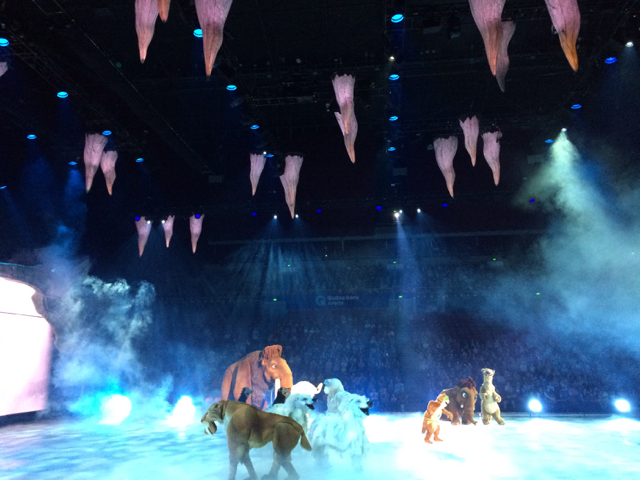 The Ice Age Live Show is showing this coming Friday 22nd, Saturday 23rd and Sunday 24th of April at Perth Arena in WA. If you are keen to see the show or read more info about it, checkout the Ticketek Ice Age Live page here.